Main | Articles | How to choose a solar panel? How to choose a solar panel? The world market sales of solar panels more is growing rapidly almost more than twice in the last few years. And according to the forecasts, demand on photo-electric solar modules will stably grow in the near future. Combination of increased demand with spread and development of the technologies of solar batteries manufacturing led to the great amount of producers at the market nowadays, and their number increases constantly. It is a quite difficult task for a non-expert, who is not acquainted with realities of this market, to find a way around such variety of brands and models, to make correct choices here, to buy only quality and reliable solar panels. That’s why our company, relying on the long-term experience of production and sales of equipment for solar power-stations, offers some advices, how to make correct choice of good solar panels. Cost of production of the photo-electric modules decreased by several times during last few years. One of reasons for such considerable cost decrease is a transfer of production capacities from USA and countries of Europe to the Asian countries, where salaries and other productive expenses are considerably less. It led to the consequencies that nowadays all basic European and American market players manufacture almost all their products in countries of South-Eastern Asia. China undoubtfully takes the first place on amount production of solar panels. Most panels with “made in Europe” label, were actually produced in Asia, only under European requirements. Similar panels produced in China released by large and reliable vertically-integrated manufacturers, are made with very similar quality as those “European” panels. Japan competes China, but authentic japan-made products, similar to American and European, substantially lose in cost competition with producers from Celestial Empire. That’s why Chinese products make the major part of Ukrainian solar panels market. Solar photovoltaic panels are the most important and most expensive component of any solar power-stations (SPS), their correct choice mostly determines efficiency, reliability and durability of SPS functioning. There are several basic factors, which enable correct choice of quality solar panels. For example, amount of produced panels; it is better to choose solar batteries of that producer, who can provide no less than 500 МW of productive capacity. But, however, the main indicator is the rating of the panel manufacturer. There is world-known classification that divides producers of solar modules into three levels: Tier 1 ( leading companies with the highest level of quality), Tier 2 (second class) and Tier 3 (lower class). If we compare cost of those panels, the difference between Tier 1 and Tier 3 panels can make up to 20%. We will try to understand, how such considerable pay up is formed and is it really reasonable to overpay for some extra quality. Let’s consider in more detailed way, what features each quality class present. Manufacturing companies, ready to make solar panels of Tier 1 quality class, have their own vertically integrated production facilities. In other words, a Tier 1 manufacturer does not simply make assembling works of solar panels, using component parts and materials (made by other producers) for this purpose, but also has its own complete cycle of panels production, beginning from growing of silicon sheets/making of photo-electric elements and ending with final assembling works on photo-electric modules. Thorough quality control is performed on all production stages. High degree of automation of all production stages is proper for making processes of Tier 1-class panels, thus human factor influence is reduced to minimum. Solar panel producers constantly work on perfection of every technological operation, considering operational indefectibility as the basic factor for high quality of manufactured products. There is an important indicator, what is a company, whose products are ranked as Tier 1 quality level, usually works more than 5 years at the global market of solar technologies. Last several years solar energy industry experiences real boom, the great number of solar panel producers appeared at the market during this time, presenting thousands of names and brands. By the way, many of these newcomers were not able to withstand the hard competition and, as a result, ceased to exist. That is why exactly 5 years is a demonstrative term for this hi-tech industry. If a company works 5 years or more, it proves that it was able to organize production processes for solar panels and elements correctly, to organize sales production and customer support service; that the company is oriented towards long-term business as well. The longer a company works at the market, the higher probability is that it will accomplish all warranty obligations declared. Tier 1-class manufacturing companies usually make warranty obligations on their products (solar modules and panels) for a term of 10-15 years or even more. Tier 1-class producers of solar panels invest reasonable amounts of money in research and development works (R&D), they have their own patents and constantly implement new innovative approaches and solutions into organization of production and technological processes. Therefore, products of Tier 1 top-brands are actual hi-tech standards with very high reliability and quality assurances. If we compare Tier 1 ratings for last few years, it is possible to mention that leading positions remain almost unchangeable, they are occupied by same companies every year. Their high-quality products can be strongly recommended for construction of solar stations. Speaking about Ukrainian realities, nowadays most popular solar panels are produced by JA Solar, Jinko, Trina, Hanwha Q Cells and other top brands. Tier 2 class producers of solar batteries make some kind of ” the golden mean” between the highest Tier 1 class and lower Tier 3 companies. Today Tier 2 solar panels take about 8-9% of global market of solar batteries. A Tier 2 class production process of solar panels is automated, although processes automation is not such a dominant element, as in Tier 1 class production. Manufacturing companies invest in conducting of research and developments (R&D), but their amount and quality of research works are considerably less than Tier 1 can provide. However, Tier 2 producers actively implement their own developments for optimization of current products and for start of production with new types and standards of solar modules. Trademarks of Tier 2 segment in most cases work from 2 to 5 years at the market of equipment for solar power-stations (solar panels). They have both scientific and productive potential, that could help to rise their class and go to Tier 1 category, but they lack for facilities and experience to make the quality jump. Tier 3 companies only make assembling of solar panels, using components and photoelectric modules made by other companies for this purpose. Productive processes have insufficient level of automation, in a great deal these processes depend on the human factor of manual labor. For this reason, solar panels even from one batch can substantially differ in quality of assembling. Companies of Tier 3 level mostly do not engage in conducting of some research activity, using borrowed (in many cases illegally) technologies and developments. Characteristics, declared by a Tier 3-class producer in supporting documentation, does not always correspond to real production specifications. Modern market is oversaturated by solar panels of this class. Purchasing a solar panel of Tier 3 class is a kind of lottery, in most cases such acquisition can be compared to well-known “to buy a pig in a poke” indeed. It is possible to purchase solar batteries of good quality, sometimes medium quality can happen, but in most cases it will be not very reliable and productive solar panel. Price and quality of solar panels: how to compare? Guarantee. More precisely speaking, when purchasing a solar panel, a customer gets two types of guarantee: guarantee of producer and guarantee of elaboration. Nowadays almost all models of solar batteries have guarantee of elaboration on photo-electric modules during 25 years. During this specified time productivity of a solar panel will make at least 80% from initial parameters, in other words, generation decline will make 20% or less for 25 years of panel exploitation. It is some kind of industry standard, but future effectiveness of a panel in, for example, 10-year term is much more important. Tier 1-class producers of solar panels guarantee that during first year of solar panels exploitation generation losses will be no more than 0,8%, so after 10 years of exploitation power capacity of a panel will decrease no more than 8-10%. Equipment producers of Tier 3 level do not make warranty for proportional decline of generation power, in real terms it can result in that during first or second year of exploitation power can at once fall down to 10%. So time of recoupment of such station will sharply increase for a year or two. If we examine this question from multipurpose perspective, then savings on acquisition of equipment will lead to substantial generation losses in future, and monetary equivalents of these losses will be much more than “saved” purchase costs. Other important factor is guarantee given directly by a producer. Foremost, solar panels must be imported in a country legally, with an official representative (the optimal choice) or with a dealer, who presents a manufacturing company. A retailer company provides warranty on solar panels only for 1 year, further responsibility falls on a producer company. If you will buy solar batteries of a Tier 1-class brand, whose manufacturing company already works more than 5 years at the market, then it is possible to be sure that guarantee obligations will be properly fulfilled during 10 years. And guarantee obligations of a company from Tier 3 segment can be considered as quite “conditional”, in fact majority of them are fly-by-nighter companies, that develop their activity very quickly, but also disappear in a quite rapid manner. Therefore, it is not a very wise choice to rely on that they will fulfill the promised guarantee obligations to the full extent. Permissible deviation of nominal power. This characteristic shows, how real power value can differ from passport data declared by a producer. For example, power of a solar panel mentioned by a producer is 250 W, and possible power deviation lies within +/- 5% limits. In real conditions it means that actual power of a panel varies within 237,5 – 262,5 W limits. Panels of Tier 1 quality, as real experience shows, have minimum deviation from values in engineering certificates, and this error is always directed to the client-positive side. A Tier 1 panel with 250 W nominal power will make no less than 250 W of actual output power. When buying solar panels, you must always require the certificate of testing. Efficiency factor of photocells is a characteristic that indicates, what amount of solar energy getting on a panel will further transformed into electric current. If we compare polycrystalline and single-crystal solar panels, the EF difference, as a rule, is not very large. Much more important what will be the cost of 1 watts of power – by this indicator, both types of panels are approximately equal, although the cost of monocrystalline panels is usually slightly is a bit higher. For this very reason EF a panel is not so important, a value higher than 14% is quite acceptable result, although solar panels of Tier 1 class can have efficiency factor up to 19-20,5%. The significance of the efficiency will be in the case when the area of the solar panels is limited, for example, the most common case – the roof solar power plants. In this case due to the choice of panels with high EF it is possible to decrease area size, required for installation. Temperature coefficient (also called thermal factor) is another important operational сcharacteristic of a solar battery. It’s all about some peculiarities of photocells functioning, they need much sunlight, but can’t stand high temperatures. When heat falls and solar panels strongly overheated, reduction of produced electric power begins, with considerable enough decrease of generation power. Temperature coefficient specifies, how much generated power will fall down after temperature increases by 1 degree. For modules of good quality thermal factor is -0,4% per 1°C, such values are normative for Tier 1 and Tier 2 class panels. Tier 3 class solar batteries can have temperature coefficient about -0,5% per 1°C. It is necessary to take into account, that testing of these characteristics is performed at 25°C, and during summer time own temperature of a solar battery can rise up to 60-70°C. Thus, when temperature of a panel increases by 20 °C, power losses will make about 10%. If a station operates on a green tariff, such power decline will convert into considerable losses of sale volumes of electric power. Bloomberg New Energy Finance (BNEF) is frequently requested by clients for a list of ‘major’ or ‘bankable’ suppliers – in common industry parlance, tier 1 suppliers – for use in manufacturing forecasts, preliminary competitor analysis, and other internal comparisons. It is very common for industry players to refer to ‘tier 1’ players, but these terms are seldom defined or described, which is unhelpful for firms outside the solar industry trying to get a basic overview. BNEF strongly recommend that module purchasers and banks do not use this list as a measure of quality, but instead consult a technical due diligence firm such as Edif ERA (formerly OST Energy), Sgurr Energy, DNV GL, Black & Veatch, TUV, E3, STS Certified, Clean Energy Associates, Solarbuyer, Enertis or Leidos Engineering. These would usually consider what factory the module comes from, as well as the brand, and give an informed opinion on whether the modules will perform as expected. ‘Bankability’ – whether projects using the solar products are likely to be offered non-recourse debt financing by banks – is the key criterion for tiering. Banks, and their technical due diligence providers, are extremely unwilling to disclose their whitelists of acceptable products. Bloomberg New Energy Finance therefore bases its criteria in what deals have been closed in the past, as tracked by our database -17,000 photovoltaic financings worldwide as of February 2017. 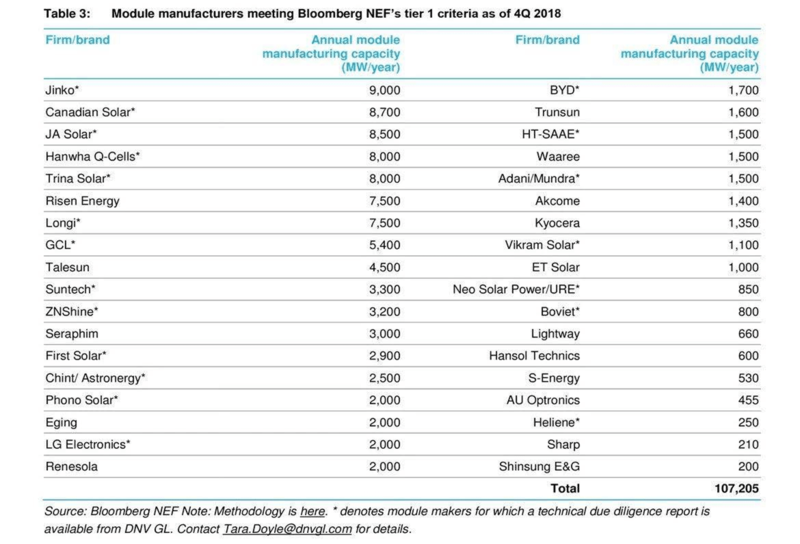 BNEF only tiers manufacturers which actually own production facilities and sell under their own brands. Companies which outsource production under brand names are not tiered. BNEF does not publish a tier 2 or 3 list. Tier 1 module manufacturers are those which have provided own-brand, own-manufacture products to six different projects, which have been financed non-recourse by six different (non-development) banks, in the past two years. These 1.5 MW+ deals must be tracked by our database, i.e. the project location (sufficiently to identify the project uniquely), capacity, developer, bank and module maker must be in the public domain. One exception is manufacturers which have filed for bankruptcy or a form of insolvency protection, or experienced a major default on bond payments; these are removed from the tier 1 list until further notice. Taking advantage of our pieces of advice, you will be able to choose the quality of solar panels more carefully that will ensure the efficient and stable operation of your solar power plant.